One very significant part of Comic Con is cosplay, where people dress up as characters from their favorite comics, television shows, movies, books, etc. Comic Con is a place of acceptance and mutual weirdness, and people come as they are, who they want to be, or someone completely different from who they are normally. Cosplay is a very easy way to spot people that like the same things you like, and are extremely committed to those fandoms. Most make their own costumes because buying one is shameful and expensive, even though making your own can mean spending hour after hour of sewing, glueing, cutting, measuring, and more. Even if you don’t spend all your free time on costuming, anyone can cosplay to any extent that is comfortable for them. As mentioned, many feel free to go in their superhero pajamas, or unicorn onesie. 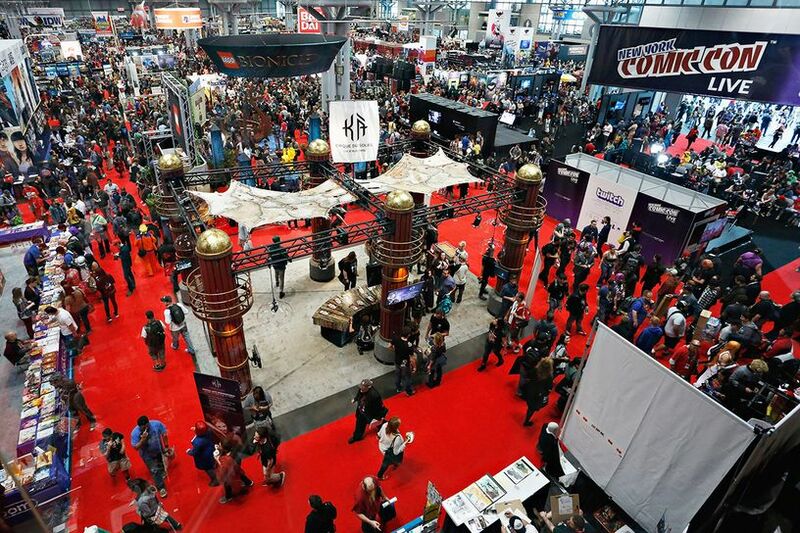 Comic Con takes place at the Javits Center, which has over 1,800,000 square feet of space. Fitting in every panel, artist, and stand is impossible to do in one day, which is why buying a 4 day ticket is generally the most economically efficient option for getting the most out of the event. On different days there are different panels, celebrities, items on sale, and artists. Comic Con was an amazing experience for both of us. Though it was hard, we were able to meet up and to experience the day together. Although the panels were not ideal on Sunday for both of our tastes we still saw and did a lot of the things we were looking forward to. At the event, there was a “Fantasy Food Truck” in which they gave out food from famous cartoons and video games. We soon realized getting these tickets to get food from the truck would be quite a struggle, as we tried three times over 2 hours but we still did not get them. Though this was extremely disappointing, we powered on to have an amazing day and made a ton of new friends with similar interests. Even afterwards, people were as friendly as can be. One person was even playing the very popular Game of Thrones theme song on the accordion outside of the venue, and looked like he was making a fortune. For those interested in attending Comic Con next year, you should be warned that getting tickets is especially difficult. Even though they are available online, they are released for sale at 12 pm on a weekday, and the only way to have a chance of purchasing one is waiting on any electronic device. If you leave the page, you lose your place in line, and have to reload the page. Tickets go extremely quickly on the official website, and if you do get the opportunity to buy them, there is a limited amount of each type of ticket you can buy. If you cannot get a ticket during this craziness, there are two choices left. You could buy from another website that sells them at higher prices, or wait for hours in front of a comic book store and buy it from them for a better price. Previous Post Welcome Class of 2021!